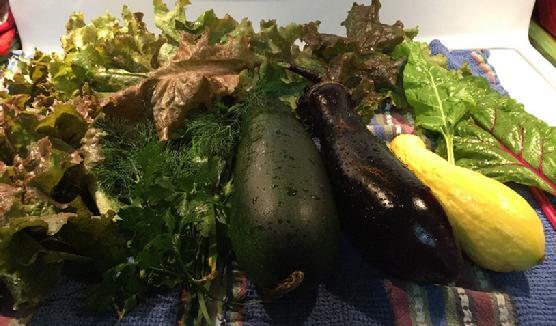 The picture above shows just one morning haul from our veggie garden. We have been growing in raised beds, no pesticides and using mushroom mulch to refresh the soil every season. We alternate what we grow where and keep marigolds growing all the time. We get lots of individual bees and we love to hear them buzz around. This morning I weeded an old bed that was getting overgrown with Bidens Alba. It's not as bad as you might think since there are parts of Shepherd's Needle that are edible, and even if you don't like it, the chickens are crazy about it! So a nice treat for the girls. If you live in Central Florida, here's a great resource - Green Deane. Learn about all the plants that you thought were weeds, but are actually food! And BTW, butterflies love Shepherd's needles too. This article about growing watercress is on a great site with lots of info about getting started with gardening. Watercress is grows easily, is tasty, and is SO full of good stuff. Watercress likes to be wet, and you can grow it in an aquaponics or hydroponics environment. It sends off roots in all directions, so once you start it you need to keep eating it! It's fabulous in salads and juices. fI you live in Florida, check out the Florida Food Summit. Looks like it will have some great workshops for folks interested in, or already growing food organically. It's September 18-20th, 2015, in Gainesville. Today we bought some fruit trees to begin some guilds in different places on the farm. The following are references to articles about growing said trees and bushes. We got two Suriname Cherries, one which we will allow to continue as a tree, the other will be a bush shape so it will be easy to harvest the fruit. The rest are: 2 olive trees, 2 pears (we already have two), 2 Barbados Cherry, 2 Goji Berry,2 Limes, one Persian, one Key Lime (yum!! ), 2 avocados and 2 pecans. Here's a great resource article on Mother Earth News about how to plan for food self-sufficiency.